Bocktoberfest ’06 ended with a bang, and I’m not talking about the fireworks. I’m talking about Godsmack. After having just finished a tour through Texas, they came back to unleash an unstoppable force that ended with a Bang. On “One Rainy Day”, in Shiner, TX, (pop-2200) there were around 10k people (and every sheriff and law enforcement agent in the County) in the middle nowhere in a field. Blue October was playing, leading up to Godsmack, and the tension in the crowd started to build. 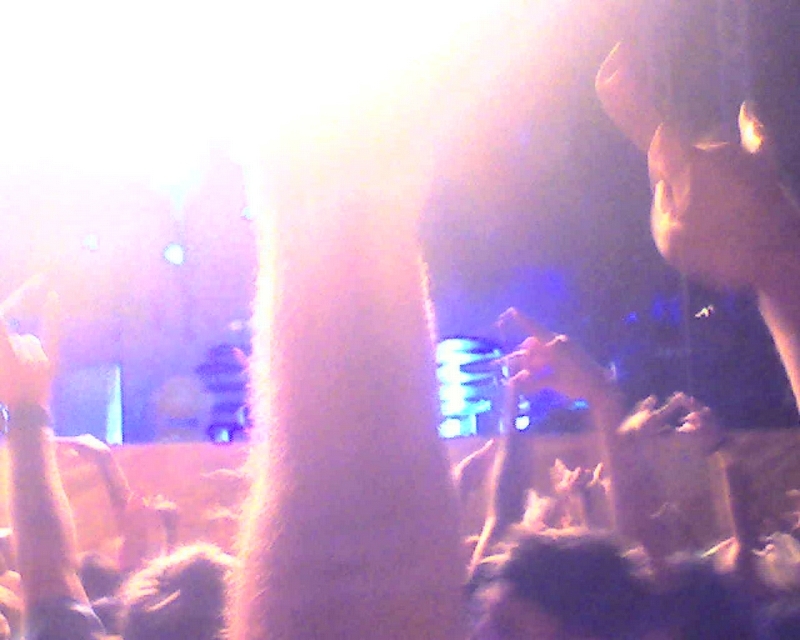 Those of us who know the heart of the music lies up front in the pit started to push forward through the sea of people. You could only get so far before you hit an impenetrable wall, unwilling to move and put more distance between themselves and the soon coming Voodoo. People banded together and formed a human wall, shoulder to shoulder, to not let others pass. And then it began….A loud crack sounded and you could feel that everyone around you had jumped a little, the same as you had. Instantly, these tired, drunk, folks whom had been standing around for 10 hours, were suddenly juiced with adrenaline and ready to go. As the tension rose and the song began the sea of people began to move. This movement continued to build in intensity until Godsmack left the stage and took the life of the crowd with them…. Determined to make it to the pit and get in to the action and good viewing distance of Godsmack, we pushed forward. As people left the front, others quickly filled their place. The further we got, the more intense it got. All the while, Godsmack released energy like I have never experienced. This was my third show and so far, the best yet. 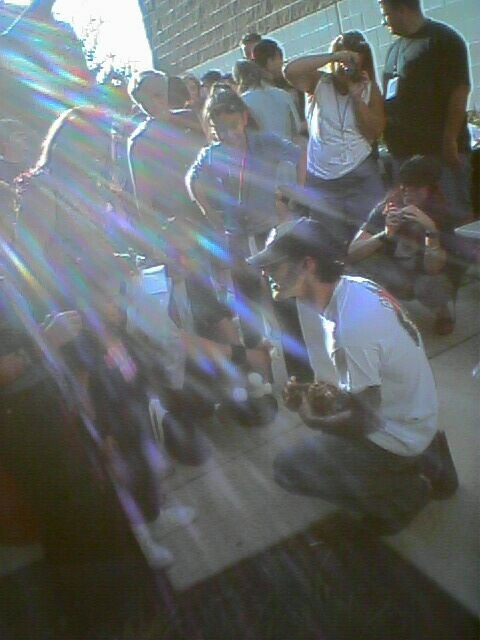 Sully was on fire, hypnotizing the crowd with his Voodoo that we so love him for. He brought the pit to a rage with “Keep Away” and “Enemy”. Soon after, the Pink Security Squad stepped in. Out of nowhere, suddenly someone was being drug from the pit over our heads and over the fence. After that, there must have been 5 more guys removed and 1 unfortunate girl who got pulled in to the pit and had no clue what to do. Several of the guys were basically yanked over the fence and dropped, to only jump up and run off, screaming like idiots, back to the front of the pit. I watched as this surreal abduction scene took place in front of me, while remaining steadfast in my position in the pit. We all unleashed our anger as we were pushed and pulled. We drank in the high of the adrenaline while staying in complete tune with the music that drove us to a feverish bliss. Then, when we thought the intensity could not get any higher, Sully and Shannon performed their legendary dual drum solo. The beat became the heart of the pit, rythmically empowering us. Sully pulled off several beautifully timed pauses where he threw a stick up in the air, caught it, and then drove back in to the drums in perfect sync with Shannon. Shiner Texas became one as we all sang “Whatever” with Sully. As 10,000 people sang the words “Go Away!” they released their anger in the loudest voice possible, combining to create the largest electrical vibe I have ever felt. The emotions were thicker than the smoke that rose from the pit. “Shinedown” was a refreshing experience of sweat and tears as the pit stood still and I stood, hands up, singing and staring at the light that permeated through and around Sully as he sang. So far, the show had been an unleashing of hate, pain, and if nothing else, pure adrenaline. We now stood their cleansed and restored, like cells collecting and storing energy to use later. Through the show Sully displayed precision and perfection with every instrument he touched. His leads and solos on the guitar, harmonica, and drums were flawless. The words he sang were suddenly spoken in to existence and imbued upon us and through us. Shannon, the heart of the band, kept the blood flowing with his amazing beat. Tony and Robbie played some amazing riffs on the guitar and bass. All the while moving across the stage interacting with the crowd, enjoying it just as much as every other person in Shiner that day. When the time came and Godsmack finally walked off of the stage, Tony stayed behind. He played an amazing song that provided the perfect ending and gently brought us back down from the cloud we had been on. As the crowd turned to mere people again and slowly walked away, the fireworks started and I stood staring at the stage, unwilling to give up the moment, unwilling to come back to reality. When I gave in to the inevitable and turned away I saw the aftermath. There were several ambulances, security and police everywhere, and the trash was the new walking surface. Then, suddenly, as the festival ended the scavengers and police came out with flashlights walking through the trash looking for anything that might be interesting. As I walked as slow as I could, back to my car, I absorbed everything I could of the experience before I left. And one last thing….. Thanks to the people in the pit! Without you, the vibe would have been wasted. Thanks to you who had my back, and to those of you who didn’t, I’m sure you remember me….